Powers/Abilities: Tarrax the Tamer was a talented animal tamer, using whips, food and other motivations to get animals to obey his commands in circus performance acts. Among his animals were elephants, gorillas, orangutans, panthers, tigers and leopards. He used these animals as part of the Circus of Crime to frighten civilians or to attack super heroes. 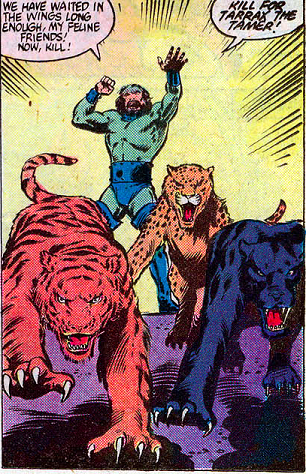 History: (Marvel Two-in-One I#76) – Tarrax the Tamer developed his skills as an animal trainer, working with many different mammal species including elephants, gorillas, orangutans, panthers, tigers and leopards. He briefly joined the Circus of Crime. (Marvel Two-in-One I#76) – The Circus of Crime pilfered riches and belongings from the crowd after Ringmaster hypnotized them but soon, super heroes Thing, Iceman and Goliath attacked, defeating the Circus before the police arrived. 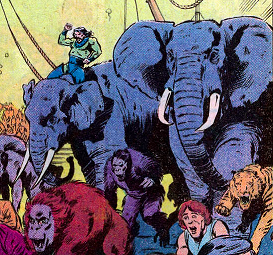 During the fight, Tarrax the Tamer sent his big cats against the Thing then after the Ringmaster released the crowd from their hypnosis, Tarrax sent his animals against the civilians to get them to get them to stampede. Looks like Thing scared Tarrax off, as he never showed up with the Circus of Crime again. Or any other “Tarrax” or “Tamer” characters.